"I believe passionately in the importance of public service..."
Hey, everybody! Take a moment out of your day to meet the Angry Reader of the Week, spotlighting you, the very special readers of this website. Over the years, I've been able to connect with a lot of cool folks, and this is a way of showing some appreciation and attention to the people who help make this blog what it is. This week's Angry Reader is Chris Lu. I am Chris Lu, the Deputy Secretary of the U.S. Department of Labor. I previously served as the White House Cabinet Secretary and Assistant to President Obama, as well as the Co-Chair of the White House Initiative on Asian Americans and Pacific Islanders. As the Deputy Secretary, I am the chief operating officer of a 17,000-employee federal department that trains workers for jobs, protects them in the workplace, and safeguards their retirement savings. As Secretary of Labor Tom Perez often says, the Department of Labor is really the "Department of Opportunity." The Labor Department has a perfect location in Washington, D.C., right on the National Mall. From my office, I have a stunning view of the Capitol, museums, and other federal agencies. Even with all of the partisan rancor in Washington, I never lose my deep appreciation for our institutions of government and the people who devote their lives to public service. My parents were born in China, moved to Taiwan, then immigrated to the U.S. to attend college. I was born in New Jersey, but I grew up in the Maryland suburbs of D.C. I think I have one of the best jobs in government, because I get to work on interesting issues that improve the lives of all Americans. When I'm not in the office, I love to run. I've run 28 marathons, which is a sign of dedication or insanity -- or both. I believe passionately in the importance of public service, so I try to encourage young people to consider careers in government or other fields where they can improve their communities and their nation. I think it's especially important for more Asian Americans to consider careers in public service. To be honest, I'm not a particularly angry person, but there are many things that are of great concern to me -- one of which is the growing challenges facing hard-working Americans who are struggling to make it into middle class. When my parents came to his country fifty years ago, they knew that if they obtained a good education and worked hard, they could buy a home, send their children to college, and save for their retirement. This was the American Dream for millions of people. Unfortunately, that dream is much harder to achieve today. That's even the case in the Asian American community, which on balance is healthier, wealthier, and more established than other racial groups. Yet, when you disaggregate the data, you find deep pockets of poverty, as well as significant health, educational, wage, and employment disparities, in the Asian American community. 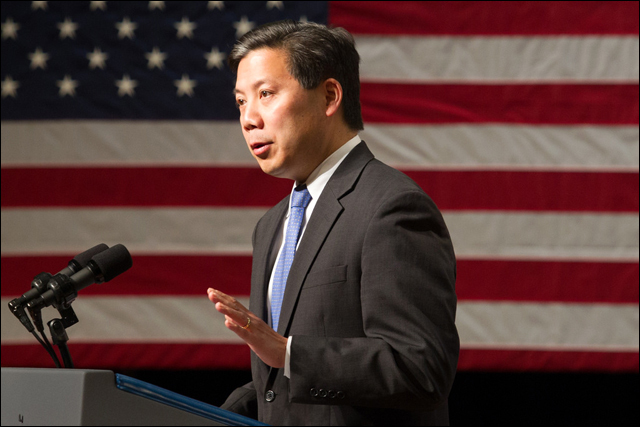 I'm proud of my work in the Obama Administration to shine a light on some of these problems and to encourage federal agencies to examine how they can better serve Asian Americans. In fact, later this month, the Department of Labor will be releasing a report on the labor market status of Asian Americans and Pacific Islanders. I look forward to sharing this report with your readers.